TERN, Laurent Giles Columbia Class Sloop. $7,500 u.s. OBO The purpose of this blog is to spread the word that there is a turn-key, small, ocean-capable boat available. The boat is a sistership design of John Guzwell's heroic "TREKKA", in which he circumnavigated the globe without major incident in the 1950's. 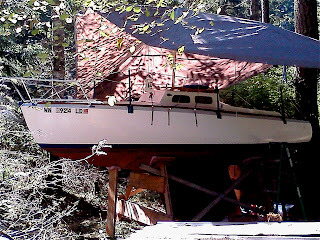 Each post in this blog describes a project, and/or contains images of the boat. The oldest archived post is a description of construction, equipment, and sail inventory. Forestay showing Hayn Hi-Mod terminal. Wire is stainless 1x19 7/32"
Outboard engine. Fresh-water flushed and empty of fuel. Approx 30-35 hrs on engine. Two fuel tanks come with. Fwd. end of boom, showing gooseneck, brz. jaws. One of two knees at mast partner. Backing for chainplate shown, typical oak frame also visible at far right. Base of perimeter-line stanchion. Painted mild galvanized steel. Very strong. Inside of perimeter line stanchion showing fasteners. Fastened through structural sheer, deck beam, and clamp. companionway and chart table (port) showing port storage lazarette, storage under chart table. Custom ladder, and "seat/ counter" aft it. Both are removable. Stbd stove (solid fuel) counter-space, storage locker under. Stbd storage lazarette. Same view from further fwd. Showing compression post, and pilot berth/settee surfaces, as well as deck beam and underside of cabin house. Bottom end of comp. post, showing keel timber and cabin sole "grate"
Depth transducer w/bung, battery locker, transducer cable. This is all under stbd. pilot berth. Rudder and keel during haulout. I had the privilege of attending a presentation by John Guzzwell last week--an event sponsored by the Wooden Boat Society of the San Juan Islands. I was incredibly impressed with his recall of other folks on extensive voyages in those days (the 50's), and by his charismatic yet humble storytelling. 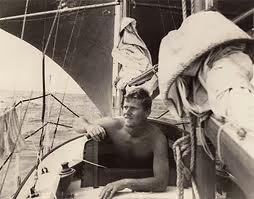 He focussed less on his own circumnavigation, more on the passage he shared with the Smeeton's aboard their ketch "Tzu Hang--their first attempt to go around Cape Horn. About 1000 miles from the cape, they were pitchpoled and dismasted, losing the dog house, rudder, and dinghy. Only by exhaustive efforts bailing the boat, and ingenuity in designing a jury rig and rudder/tiller system, did they eventually make landfall in South America. He also showed the 16mm film footage that he had taken of their passage, which was captivating to watch, and showed sea conditions right up to their capsize. Their was minimal footage of Trekka under sail, which I was keen to see more of, but was much harder for John to get while sailing his own boat. An amazing evening, and inspiring to be in the presence of someone who followed their dreams, and had he courage to see where that would lead their life. After a productive period of time this last summer, I am proud to say that my list of projects aboard TERN are almost entirely complete....I decided that I would just continue to teat TERN as though I'll own her forever, though she is still for sale! Port side, showing new Lexan portlights and modified foredeck. Stbd. 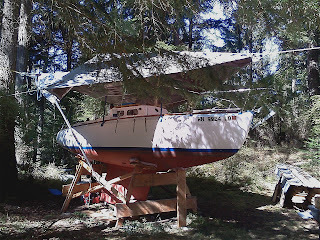 bow showing new pulpit, dorades removed, new cabin house paint. I customized and installed the custom stainless bow pulpit. New welded mounting plates. Note internal condensation drain hole at bottom. Removed bulky dorade ventilators on the foredeck and replaced with flush mount, opening access ports. Customized and reinforced the cockpit coaming to accommodate for sheet-to-tiller self steering gear. Jorgen Haarle shaping stainless brackets for self-steering attachment. Placing for fit and fastening. These are now primed and painted white. Replaced old cleat-mounts with gum-wood ones and painted. Re-intsalled sheet cleats. Removed the 2 wooden chocks at stern (one had broken) and replaced with stainless ones. Removed old plexiglass portlights and replaced with bronze-tint Lexan. Re-painted cabin house (interior and exterior) while the portlights were out. Toe rail stripped and sanded. Cabin house primed and painted. Stripped to wood and re-finished the wooden cleats and toe rail with 3 coats of Interlux sealer followed by 3 coats of Interlux Perfection Plus. 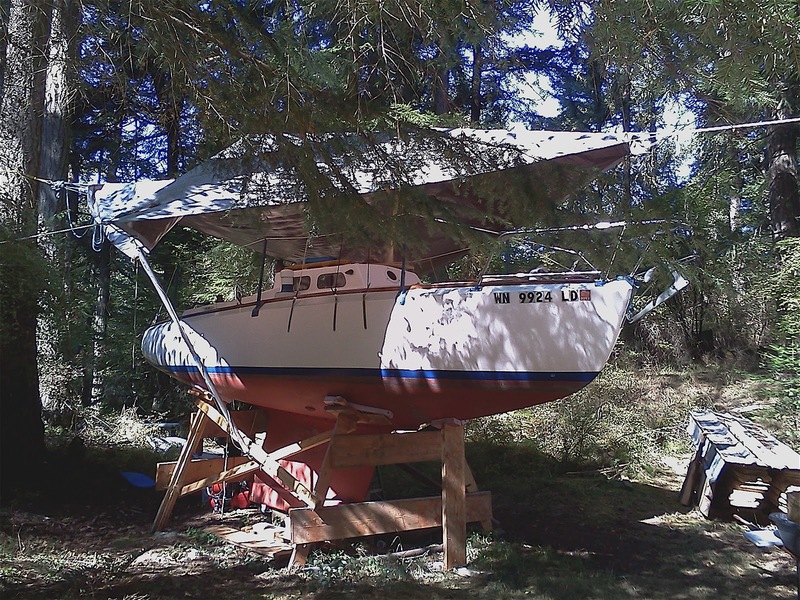 I had hoped to sail the Wooden Boat Show circuit (Vancouver, Victoria, Deer Harbor, Port Townsend) in late August this summer, but was about three weeks too late in completing these projects. Guess it'll have to wait until next season. That's OK--I wanted to take my time and do things right; the satisfaction of a job well-done is always worth it.